As we draw to the end of this very unpleasant referendum campaign, it is worth, I think, recalling why we are where we are. It essentially goes back (as do so many things in modern Britain) to Mrs Thatcher. It was her volte-face on Europe that split the Conservative Party, the split that ultimately led this referendum to be called. After being strongly pro-European in the early part of her premiership, continuing the tradition of pervious Conservative leaders (including Edward Heath, who took the UK into the EEC, as it then was), including signing the Single European Act (the Luxembourg Treaty) in 1986, which gave the first real powers to the European parliament, she did a 180 degree turn on the subject for reasons best known to herself. Half the Conservative Party follwed her, and half continued allegiance to the older conservative pro-Europe line. The next leader, John Major, was bedevilled with this problem, and could not solve it, though he got the Maastricht Treaty, which created the modern EU, through. David Cameron's solution to this same, ongoing problem of the bitterly-divided Tory party was to call this referendum. The nation overall did not want it: it is important for our European friends to understand this. The European Union was actually proposed by a British Conservative Prime minister in the first place: Winston Churchill. But it was always unclear whether he saw Britain as part of that future entity or not. Probably, he did not: he shared the romantic Victorian-Edwardian attachment to the dream of some future theoretical and impractical 're-union of the English-spaking peoples' (presumably including the USA, Canada, Australia and so on) that would then separate us from Europe. A similar transatlantic-gazing viewpoint is it the root of the views of many of the current Leavers: that we can somehow go on to exploit our cultural and economic attachments with those anglophone parts of the world more thoroughly if only we can leave the EU behind. Unfortunately, in the real world, as opposed to that of Rudyard Kipling's and Arthur Conan Doyle's fiction, we can't. There are of course some on the radical left of UK politics campaigning for 'Leave'. Some of these are people for I have great respect. Baroness Jones (Jenny Jones, former Green London Assembly Member) is one of these. I attended her leaving party at City Hall before the May election to congratulate her ( and her colleague Darren Johnson) on all they had done for cycling in their time at City Hall. Nevertheless, I'd like to take her to task on her pro-Brexit position (which is at odds with the majority opinion in her party). This essentially amounts to: 'THe EU is broken and undemocratic. There's no chance we can fix it, so we should leave'. I find this a very strange position for anyone of an internationalist disposition to take. So if the EU is 'broken', we leave, and what? We leave 300 million people in a 'broken' institution, and we give up any influence in trying to improve it or reform it? That can't be right. I can only imagine the rationale is that she (and others like her) hope that the EU will simply fall apart in reaction to Brexit. I have to say I find this a deeply improbable proposition. The UK leaving the EU will not have that much effect on the citizens of the rest of the Union, or on their politicians. The EU will be able to adapt and continue. The supposed fragility of the EU and its institutions has been consistently overplayed by our media. We've heard nothing about the Euro (ever) except 'It's on the brink of collapse'. Except that it hasn't collapsed. It's had a rocky time, but basically, this project, to place under a monetry union the economically diverse and divergent nations from Portugal to Austria and Finland to Crete , this incredibly improbable and ambitious project, has succeeded. It's not going back. Similarly, if the UK leaves, there's going to be no shortage of new nations wanting to accede to the EU, and there's going to be no domino effect of old members wanting to leave. The EU is going to continue, grow, and strengthen as an entity, without us. We'll have to negotiate a new deal with the EU over trade and labour movement, and it's going to have to have many of the characteristics of the deal we have now. If we cease to pay into the European budget we're going to lose all influence over how the rules are set up, but we're basically going to have to continue to abide by those rules to trade. There's not going to be the free lunch the Brexiters want. We're going to have to accept freedom of movement if we want to be within the trading block on anything like reasonably advantageous terms. Or, maybe we'll be offered a deal whereby we pay to be out of the agreement on freedom of movement but within the trading area. In either case, we're not going to get what the Brexiters claim we might get. The EU has to defend itself, ultimately, in response to defection. It obviously can't offer an ex-member state a deal so advantageous that it might tempt others to secede. There has to be a punishment for leaving the club. That punishment will surely be felt in the purse of ever UK citizen in a Brexit world. Participation in trans-national programmes... has more impact than those carried out by single countries, even if they are funded at the same level. The coordination of projects across the European continent prevents duplication of effort, and allows scientists to more effectively share resources. Much the same goes for the arts, for which freedom of movement is hugely important. And anyway, the Brexiters aren't saying the money we would save from EU membership would be spent on science and the arts. They seem to have committed that money to building more hospitals. Or something. But we won't have the money for hospitals if our science base, on which our high-tech industries depend, collapses. In fact the Leavers have no coherent economic plan, and little understanding of why the EU is there in the form that it is in the first place. It was a response to a Europe almost destroyed by a century of war between major powers (if you date that century back to the Franco Prussian War of the 1870). The EU has made the Europe that generated those wars an unimaginably remote history to all who are young today. The 'democracy' arguments trotted out by the Bexit side make no sense. None of them seem to have noticed that the UK is still dominated by a monarchy and a hereditary aristocracy and that two-thirds of our law-making parliament is unelected. The European Parliament, elected by proportional representation, is the most democratic layer of government England (outside London, which has the GLA) has got. The Council of Ministers consists of people appointed by the Westminster government and its equivalents in the other member states. There is a huge range of public bodies in the UK that wield great influence over citizens' lives that are far less democratic. I don't hear the Brexiters in general talking about removing the undemocratic influence of mediaeval bodies within the UK like the Corporation of London, the Royal Parks Agency or the Verderers of the New Forest. Of course the EU is deeply imperfect in its democratic structures. But it is misrepresented as some sort of monster developing in its own way beyond the control of the citizens of its constituent states. Most of the nonsense claims of the Brexit side in this respect are simply knocked out by the observation that our government and parliament have had a veto over every significant change in the powers and operation of the EU over its history since we joined. We have agreed to it all: our Prime Ministers, cabinets and parliaments from Heath to Cameron have agreed to it all. We could have stopped anything we didn't want, and in fact we did stop lots of things. Other provisions, like the Shengen agreement on open borders, and monetary union, we opted-out of, for better or worse. The veto we had over treaty changes, plus the influence that being one of the biggest economies and biggest contributors made us, ensured that the UK influence in the development of the EU was always huge. We created the EU, with others. For us to leave it now would be like a person abandoning a house they had built, and into which they had sunk all our resources, with no realistic prospect of finding another remotely as comfortable or accommodating. The EU is not a superstate, and is not heading to be one. There's a simple economic reason it can't be one. It's central administration takes only about 0.5% of the member nations' GDP. Its bureaucracy is on the scale of that of an English county council. I've seen it. I've been to Brussels to talk to the Transport Committee Chair of the European Parliament about cycling (who was then an English MEP). Such a small organisation with that level of funding can never take control of Europe in the manner of the Federal Government of the United States. It would take a massive change of policy on behalf of all the governments of the member states, acting unanimously, to start heading it in that direction. That ain't going to happen. And as for Ever closer union, that famous phrase, what doea it mean? I think it is correctly interpreted not as a vision of a superstate; I think it means rather an ever-closer spiritual and cultural union, an evolution towards a state of cooperation between the European peoples that makes conflict between them ever less conceivable. I believe this is what the founding fathers of the EU meant by that phrase. Then again, perhaps it doesn't mean anything at all. I could go on and on on this subject, but I had better not. I haven't mentioned environmental legislation, worker's rights, so many other aspects of the story of why the EU is a worthwhile institution that has done the its peoples good. And I haven't touched on the how a UK vote to leave the EU will almost certainly herald the break up of the UK, through triggering another Scottish independence referendum, as Scotland will certainly vote to remain. Even more serious are the likely consequence for Northern Ireland and peace in the Island of Ireland, where the existing post Good Friday Agreement consensus, of devolved provincial government within a UK that is united with the Republic within the EU, will be broken. And, in case you are one of those worried by immigration (I'm not, like most people in London and other big cities who are used to everyone being immigrants from somewhere) I haven't touched on the fact also, that with less co-operation from EU member states and France in particular, we'll probably get more illegal immigration and asylum claims to deal with. 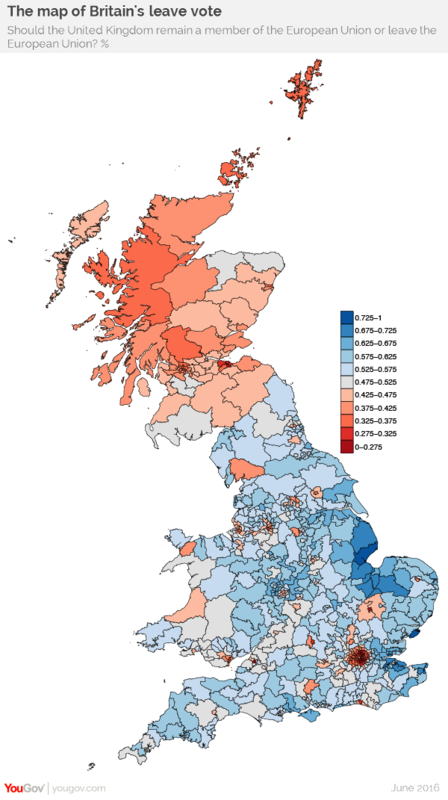 YouGov's map of voting intentions by local authority. Scotland will vote 'remain' and the UK cannot survive Brexit. For cycling, the usual topic of this blog, the freedom of movement we have enjoyed since EU accession I am convinced has contributed to the cultural and information-exchange process that has allowed us to reach the point of importing some of the best pro-cycling policies Europe has produced into at least some British cities. For example, if we hant't had freedom of movement, would the Hembrows have settled down in Assen and provided us with the information and cross-cultural Dutch translation that we needed for the Go Dutch campaign in London? Such questions are unanswerable, and I need to get this blogpost out in time to make, I hope, one or two undecided voters to think in some new ways. England was deeply part of cultural Europe until the reign of Henry VIII, the break with Rome, and the destruction of most English art by his henchman Thomas Cromwell. Our focus was more on remote territories for the next four centuries, but our attention was forced back to Europe by the wars of the twentieth century and the loss of our empire. The accession to the EEC was an important, defining event for those of my generation, too young to vote in the 1977 referendum called by Harold Wilson (whose Labour cabinet was divided over Europe), but brought up, post-decimalisation and post-metrication to think, at least to some extent, of ourselves as European citizens, with our maroon European passports. I am a product of the wider Europe, coming from a family on my father's side of wandering, Sephardic Jews, traders between the Christian and Moslem worlds, who had come from Spain at the time of the Inquisition, and spread across Europe, North Africa and the Near East, to Morocco, Italy, Greece, Turkey, Israel, France, arriving in my great grandfather's time in England in 1898; while on my mother's side I am a descendent of mid-european Catholics, inhabitants of a mountainous and fiercely independent region, the South Tyrol, fought over by Papal, Napoleonic, Hapsburg, and Italian armies for centuries, and still not really, comfortably settled into one of the states of modern Europe (though now forming a largely German-speaking Italian province with a high degree of autonomy from Rome). I am one of those people whom Boris Johnson claims don't exit: who feel an 'underlying loyalty to the idea of Europe', that is, feels 'European'. I think there are a lot more of us. I think there may be enough of us to swing this divisive and dividing referendum against the old England post-Imperial delusionists on Thursday. We will see. Excellent. And you're right: without the EU it's doubtful whether the transfer of ideas between NL and the UK could have happened. Certainly it's unlikely that we could played our part. It saddens me to see the UK even thinking of throwing away all that the EU has achieved. Another issue on this, is how come this has been passed to a referendum (or plebiscite, I lose track of which is the 'correct' term)? Its only so that politicians can say "It's not my fault, you voted for it" whichever way the country jumps. I was under the impression that we have a representative democracy, where we vote in paid professional politicians (with all of their SPADs and other advisors and support staff) to make the big decisions on our behalf??? As I say it's purely due to the fundamental split in the Conservative Party dating from the times of Thatcher, just like the referendum of 1975 was due to a split in the Labour Party of the time. Basically, you are right, we don't have referendums on these questions, our governments negotiate and decide. We've never had referendums on whether to be part of other international bodies or agreements, such as the UN or NATO. And the English people have never been asked if they want to be in the United Kingdom. One referendum on the EU (EEC) was more than enough. "And, in case you are one of those worried by immigration (I'm not, like most people in London and other big cities who are used to everyone being immigrants from somewhere) ..."
you have assumed people are concerned about where immigrants come from, and ignored people's concerns about the rapid rise in the numbers of people. In Northampton, nearly half of the people on my street are not British; we have Polish, Romanian, Hungarian, Latvian, Vietnamese, Chinese. I consider this a good thing. However, the rapid influx of people means that almost any planning application is approved, or if rejected by the local council is overturned by the planning inspectorate in London. As a result Northampton is growing at an unprecedented rate with housing being built anywhere and everywhere. The same is true of other Northamptonshire towns such as Wellingborough, Kettering, Corby, Daventry. Towcester town and Silverstone village both have plans to double the number of housing in the next 10 years, despite the lack of railway stations and the A5/A43 traffic already being stationary twice a day. Try to imagine how that affects the lives of the existing residents, with a drastic shortage of infrastructure and services. I can see that it might be easy for people living in the centre of cities to imagine that people living in towns and villages are against immigration because of the foreignness of the immigrants, but this is not necessarily so. While it is true as you say that 'almost any planning application is approved, or if rejected by the local council is overturned by the planning inspectorate in London' I'm not sure that's really got anything to do with immigration. It's planning law. There's a very strong bias in planning law, laid down by Parliament, towards approval of all new developments, irrespective of what existing locals think, or councillors think. Council planning committees can only reject applications on very specific and limited grounds, not on the basis of majority opinion of what local people think. This is, of course, a big limitation on local democracy. I don't believe the shortage of housing is what it is claimed to be. I know a large number of older people living in housing that is unnecessarily large for them, after their families have moved away. I also seem to know a lot of people who have acquired multiple homes. We've failed to introduce fiscal incentives to induce these people do downsize and liberate that housing stock for families. And a large amount of the large-scale property development I see around me in North London now seems to be empty after completion: purchased, I presume, but left empty, for one reason or another. This is another area that if the government gave councils the powers to get to grips with, we wouldn't need to build so many new homes. The troubling thing about the debate last night is that the Brexiters have run a very effective campaign, to be sure, but it is mostly based on falsehoods. 60% of UK laws come from the EU. We spend £350m a week propping up the EU. The EU's anti-democratic; the EU's dictatorial; leaving the EU means we can take back control of our immigration system; leaving the EU means we can take back control of our democracy; and so on. And why won't the Prime Minister exercise his veto on Turkish membership? It's all nonsense. After the debate, one of the audience members (a Brexiter) was asked if her mind had been changed, and of course it hadn't. She repeated the claim that 60% of UK laws come from the EU, and completely ignored the point from Ruth Davidson that this was a "blatant untruth". Of the hundred and something laws passed in the UK during the last parliament, Ruth Davidson said, four of them originated with the EU. For myself, I lived in Germany for about five years when I was in the Army. I learned to speak the language a little bit, had German girlfriends, and know from experience therefore that the British way of doing things isn't the only way, and is very often not the best way, and that we would be better off embracing a wide range of opinions and cultures, and working together with our friends in Europe.